In 2008, after seeing haunting footage of seven hours of interrogation of a 16-year-old boy, filmmakers Patricio and Luc, were shocked and disgusted by the US and Canadian governments’ treatment of Omar Khadr. 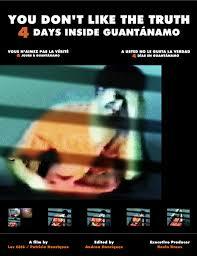 They made this documentary to bring to light the truth of what is happening to a child in the black hole called Guantánamo Bay. They appropriately used Omar’s own words to his interrogators, “You don’t like the truth”, as the title of this award-winning documentary that moved thousands of people around the world and shed new meaning to the term “war on terror”. YOU DON’T LIKE THE TRUTH – 4 days inside Guantánamo is a documentary based on security camera footage from the Guantánamo Bay prison. This encounter between a team of Canadian intelligence agents and a child detainee in Guantánamo has never before been seen. Based on seven hours of video footage recently declassified by the Canadian courts this documentary delves into the unfolding high-stakes game of cat and mouse between captor and captive over a four day period. Maintaining the surveillance camera style this film analyzes the political, legal and scientific aspects of a forced dialogue. This encounter between a team of Canadian intelligence agents and a child detainee in Guantánamo has never before been seen. Based on seven hours of video footage recently declassified by the Canadian courts this documentary delves into the unfolding high-stakes game of cat and mouse between captor and captive over a four day period. Maintaining the surveillance camera style this film analyzes the political, legal and scientific aspects of a forced dialogue. This film begs the question: Who are the terrorists?